Workplaces are changing faster than ever before, thanks to the influx of a new generation of employees – millennials. These young adults have a bad reputation for being glued to their smartphones and having an inflated sense of self-importance, however, with proper direction this translates into an incredibly capable workforce that is utterly fluent in technology, motivated to push past conventional obstacles and keen to prove their value within an organisation. Here are a few pointers about how to harness the dynamic energy of a millennial workforce to create a brighter future for your firm. The days of “what can you do for this company?” are long gone, and the millennial mindset is much more focused on “what can this company do for me?” Traditional perks like staff discounts, pension plans and a competitive salary simply don’t add enough value in a market where free gourmet lunches, flexible working and company socials are available at other firms. 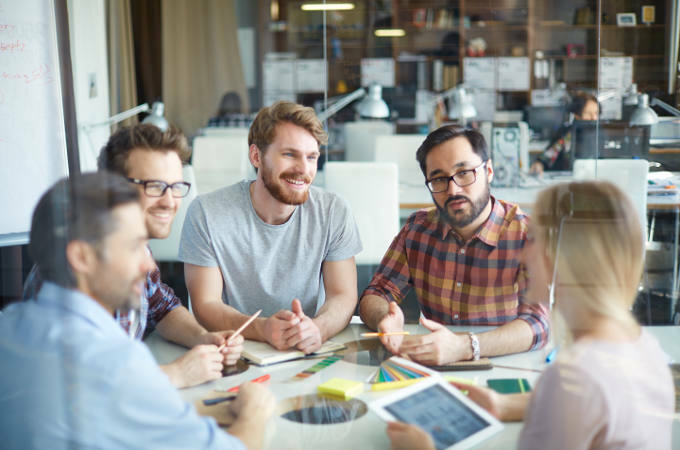 A big bonus for millennial employees is the sense of inclusion – the impression that they are able to actively contribute to the direction of the company they are working for. Rather than following the outdated formula of management prescribing strategy from the top, it’s time to reverse this and give employees the opportunity to develop their own action plan. To do this, your teams are going to have to fully understand your company vision and objectives. This needs to be done in an interactive way, supported by an open discussion about goals, culture and targets. Holding all-hands meetings for employees to attend makes this possible, where everybody is given an equal opportunity (and responsibility) to interact with leadership and contribute in key decision-making. While this might initially seem like a step back in terms of efficient planning, it’s a leap forward for building a healthy workplace culture that attracts – and retains – top tier talent. Town hall meetings are a space for sharing critical information and building an environment of trust, expression and collaboration. When individuals are united by a shared purpose, it makes for a strong, productive company. Research has shown that the anonymity provided by submitting questions and responses via a digital tool, such as an Audience Response System, greatly improves the quality (and honesty) of the interaction. Where previous generations might have been more comfortable openly voicing opinions than using technology to get their point across, the millennial workforce does not have the same barriers. Crowdsourcing ideas, feedback and queries puts less focus on the individual and more emphasis on the issue at hand, creating a more open dialogue between management and teams as a whole. It takes the politics and personal relationships out of problem-solving, empowers even the quietest employees to have their voice heard and allows potentially controversial issues to be brought up without fear of repercussion. For more details about how CLiKAPAD technology can help your company work, train and learn collaboratively, get in touch. We have many years’ experience in setting up creative interactive solutions and would be happy to discuss your requirements.